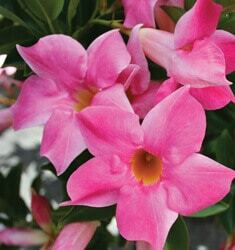 Striking flowers and a bushy shape for true Mandevilla performance with the look of Dipladenia. A prolific bloomer with beautiful pink flowers over solid green leaves. Blooms spring until fall.